I think maybe Roxie is broken, or maybe there is something wrong with her. Why? Well, I’ll get into that. 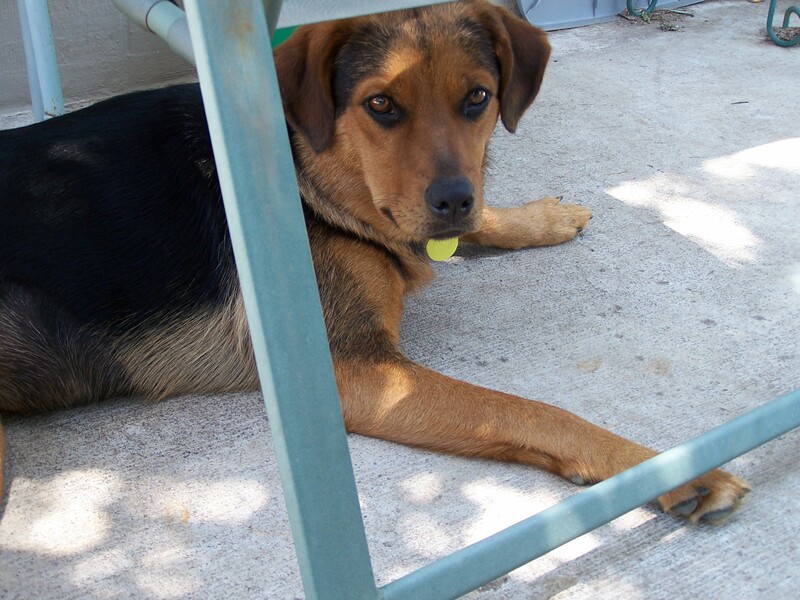 As most of you know, Roxie was a rescue. For those that are new to this blog, Roxie spent pretty much her entire young life tethered by a heavy chain to a pole. There was no shade, no shelter from the raging storms of summer or the bitter winds of winter. As if that wasn’t bad enough, she rarely had enough food or water. Last year, when Kansas was experiencing cloudless skies and triple digit heat for days and days on end (we’re talking 110 – 115 *F), Roxie was laying there in the dirt with the sun beating down on her and not enough water. When it snowed last winter and dumped sleet on us and the wind howled out of the north a 25 to 35 miles and hour, Roxie had to endure that too. The neighbors near where Roxie was incarcerated in her circle of hell around that pole, called and complained to the county to no avail. So they turned to a local news station to highlight the plight of Roxie and the several other dogs living in the same conditions on the property. This was a good thing, maybe something would get done. Unfortunately, when the owner got wind of a news station coming he loaded Roxie and two other dogs into the back of his truck and left. When he returned a short while later, the dogs weren’t with him. He had dumped them, in February, in Kansas during some of our most brutally cold weather we had this last winter. Many people upon hearing this took to the roads to search in vain for the dogs, even during a near blizzard they continued their search for them. Although one was spotted, no one could get near him. I guess he had enough of humans. 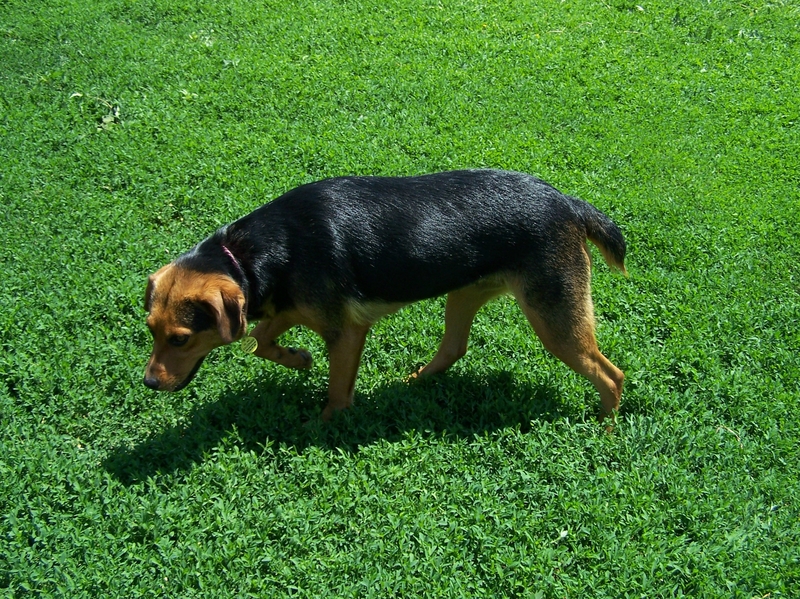 A month later, Roxie showed up over thirty miles away, very skinny and in bad condition. Thankfully, she’d chosen a vet to approach, someone who had the knowledge to help her. The vet then took her to the Pratt County Humane Society. 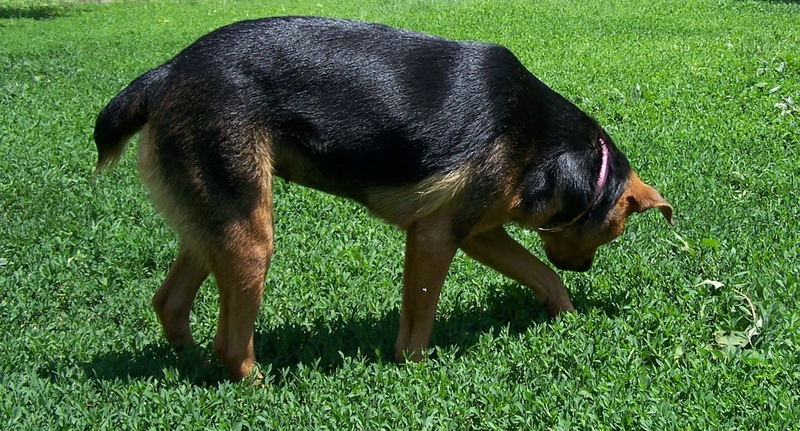 I came across Roxie a month later while searching around the web. Something about her face called to me and her story broke my heart. And here is where we get to the broken part. 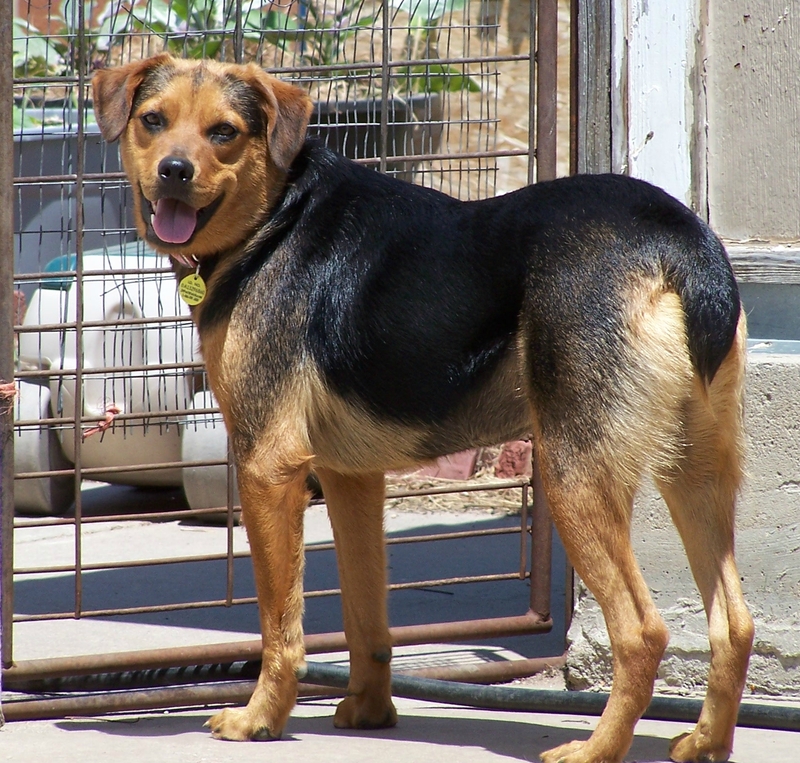 Roxie is a Rottweiler/German Shepherd cross that is somewhere between 18 and 24 months. So I was prepared for anything. I envisioned giant craters dug in the yard, shredded shoes, a ripped up couch, etc. We were prepared to face these things. She’d never been inside, so I was prepared for pottying in the house and a long haul. One that would be worth it, but a long haul none the less. Roxie has done none of these things. She has never once pottied in the house. She hasn’t chewed up any shoes or toys (okay, she did chew a couple of wooden building blocks but I haven’t met a dog yet of any breed or age that could resist those), she hasn’t dug any holes, or chewed any furniture. I’m surprised she was able to chew up the wooden block, all of her teeth are very warn down. My vet told me it was likely from chewing on that chain she was stuck on. He said he sees it a lot in dogs who have been chained like she was, especially when they don’t have food. We even left her alone and loose in the house for 3 hours or so while we took the kids to the zoo. We came home to a house still free of any mischief or potty on the floor. Roxie is beyond wonderful with the kids. She gets along great with the other dogs and the cats. Never bothered the chickens. 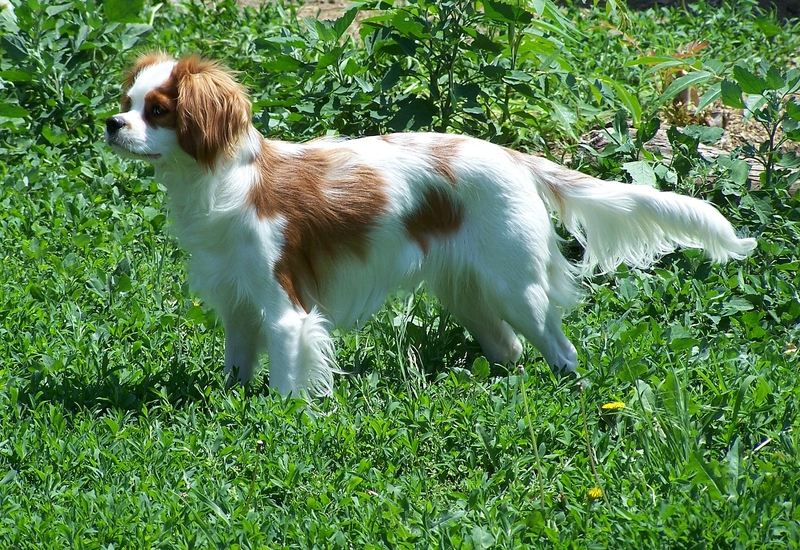 My female Cavalier likes to guard the food dish. Roxie tolerates this with the exceptional patience of one who is amused by such behavior from a such a small dog. In fact every now in then she will perk her ears and get that goofy look on her face when she’s playing and purposely walks a little closer to Abby just to make Abby pitch her growl up higher. Abby has gotten better about that with training and is learning that after she eats she can’t stand and guard it because other dogs want to eat too. Within a day of arrival, Roxie learned the command “sit.” With two days of gentle teaching, she learned not to jump up on people. She never tries to grab food that isn’t hers, even if it’s half a peanut butter and jelly sandwich sitting at nose level on the coffee table while my youngest runs to the bathroom. Wish I could say the same about my little Cavalier. At night when it’s time to go to bed, she sees me getting the bed ready and runs in and jumps up on it. She bounds across the bed to get loved on and then I tell her, “Get in your spot.” And she immediately goes to her spot at the end of the bed and curls up. It’s a king size bed, so there is plenty of room. Even so, she likes to scooch across it and lay her head on my foot. But do you see what I mean? Is it really possible that Roxie could be so absolutely perfect? She’s only been here a couple of months and already everyone loves her so much its like she’s always been here. So in jest, I say that I got a broken dog because she didn’t do any of the things one would expect out of a large breed cross that’s her age and has her background. She truly is the perfect dog. I am so lucky she came into my life and eternally thankful to Pratt County Humane Society for letting me bring Roxie home. So, if you are considering getting a dog, please check out your local humane society and don’t pass up those teenage large breed mixes. Even if Roxie had done all of the things I expected, she would have eventually grown out of it and I would have spent the time needed to train her to better behavior. Roxie, awesome that it is that she didn’t do any of that, would still have been more than worth it even if she had eaten my couch or dug craters in the yard. And please, please spay or neuter your pet. There are far too many waiting desperately for a home that will offer back the love they are so willing to give. On a side note: humane societies are always in need of foster homes for dogs waiting for their furever home. Your willingness to take them in a foster them, may very well save their lives. And now, of course, pictures! Roxie has grown a little taller and put on weight and muscle since she came here. Yes, I forgot to mention that. She is a dream to bathe. Stands still, no jumping, whining or barking. She doesn’t try to get out of the tub until I tell her to and she waits to shake until I’ve scrubbed her good all over with a towel and open the bathroom door. Have I mentioned how much I love my Roxie girl? Thank you, she really is an absolutely awesome dog. I couldn’t be happier with her. We have a rescue dog too, kept in much the same conditions as Roxie, but trained to hunt hare (he’s a Spanish greyhound). He can’t have been much good at it. Rescue dogs seem to be eternally grateful for their home. It’s hard to imagine how we managed without him! They really do seem beyond grateful. When they’ve lived a hard life, they know how good they have it when they get a good home. I’ve always found rescues (of any animal) to be the best. Roxie has only been here a short time, but already I couldn’t imagine my life without her.